IBC2010 held in Amsterdam every September, is the global electronic media industrys big get-together. This is where over a 1,000 of the worlds key technology suppliers come to showcase the latest and greatest that modern technology has on offer and for those who create, manage and deliver content, it is a great opportunity to play with all the new toys on show. Of course, it is not just about showing off new products but also a chance to discuss and debate the developments and challenges that face the industry now and in the coming years ahead. For the HD DSLR community there has been much to get excited about at this years IBC, especially the range of new cameras from the likes of Sony and Panasonic. 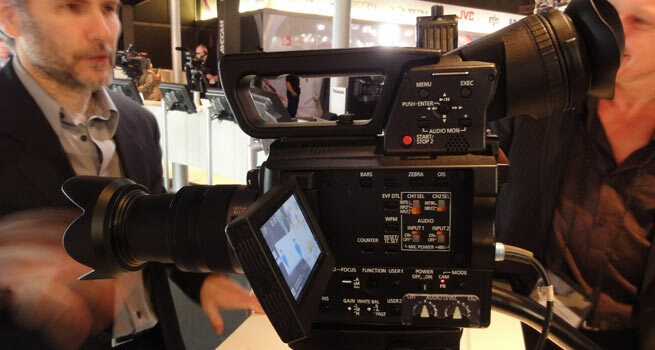 Panasonic in particular, has got everyone talking about their latest offering, the filmic AF100 video camera. I mentioned this camera, which was a prototype at the time, on my blog last April. It was first announced at NAB and since then has been talked about endlessly online, mainly about whether this camera was going to be a DSLR killer. Now the first working prototypes have been shown at the show and from what I gather Panasonic have had a lot of people drooling over this camera, especially when they heard the price of £4000. Posting from the show floor at IBC, this is what Barry Green, resident tech guru at DVXuser, had to say about this new camera.